Our granddaughter Lia is currently in the fourth grade and is studying California Missions. Her brother Tyler is a high school sophomore who has been receiving lots of inquiries from colleges all over the country because of his recent high PSAT score and has become interested in visiting college campuses. So a couple of Fridays ago when they had no school because of a staff development day in Castro Valley we decided to spend most of the day visiting Mission Santa Clara which is less than an hour away from our Crow Canyon home and just happens to be located in the middle of a college campus. 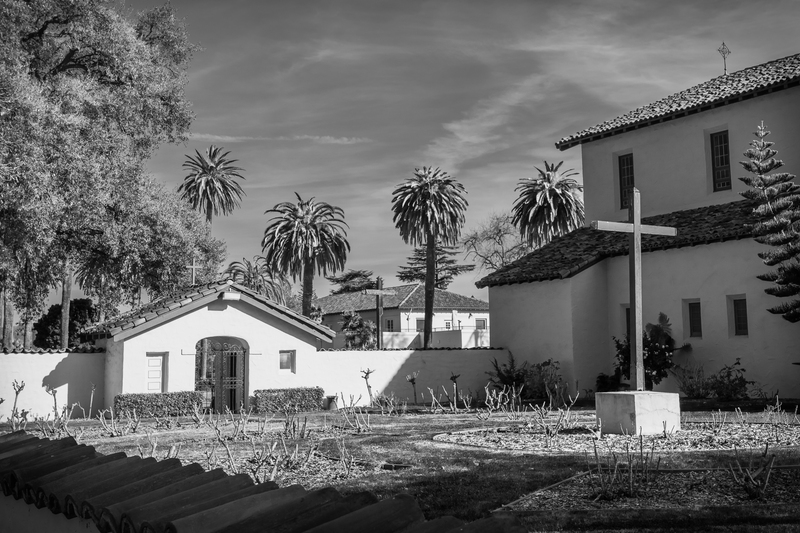 Mission Santa Clara is the eighth of the 21 California Missions and is located on the campus grounds of Santa Clara University. Another view of the Mission. 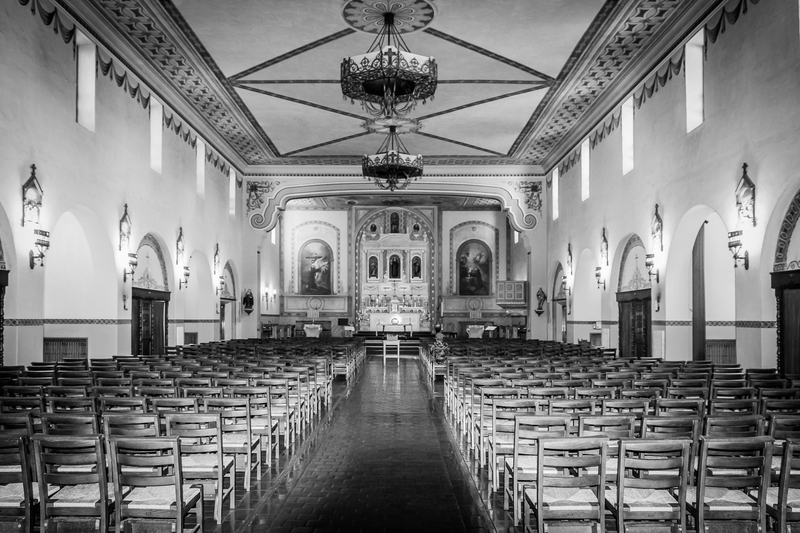 After the sixth Santa Clara mission burned down in 1925 it was rebuilt to resemble the fifth mission as it looked in 1825. 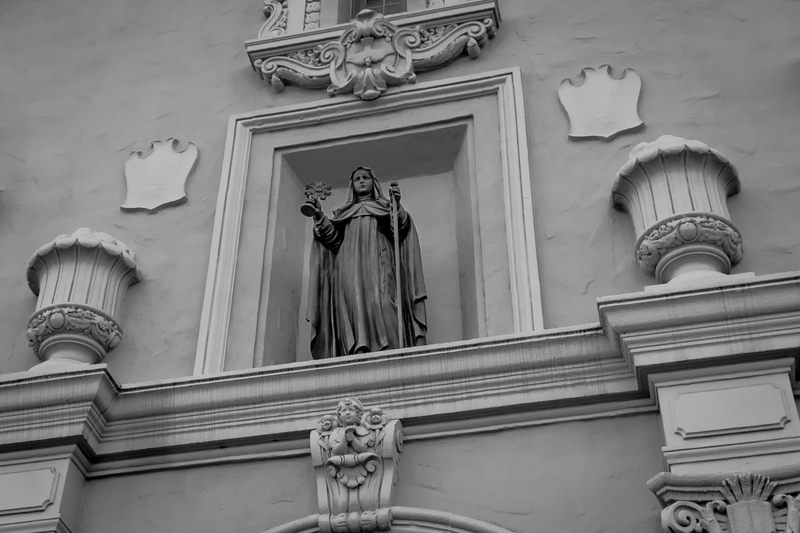 Santa Clara (St Claire of Assisi) over the Mission’s main entrance. 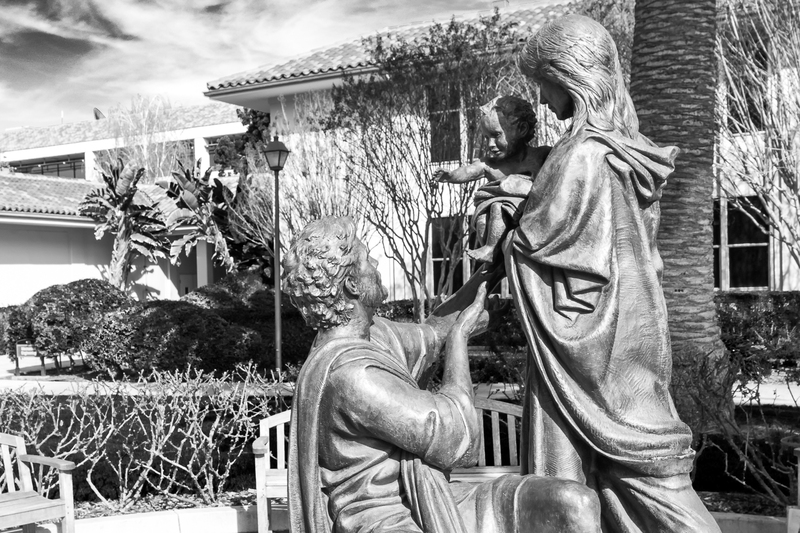 Santa Clara was the first Mission named after a female saint. St Claire was a companion of Saint Francis of Assisi. 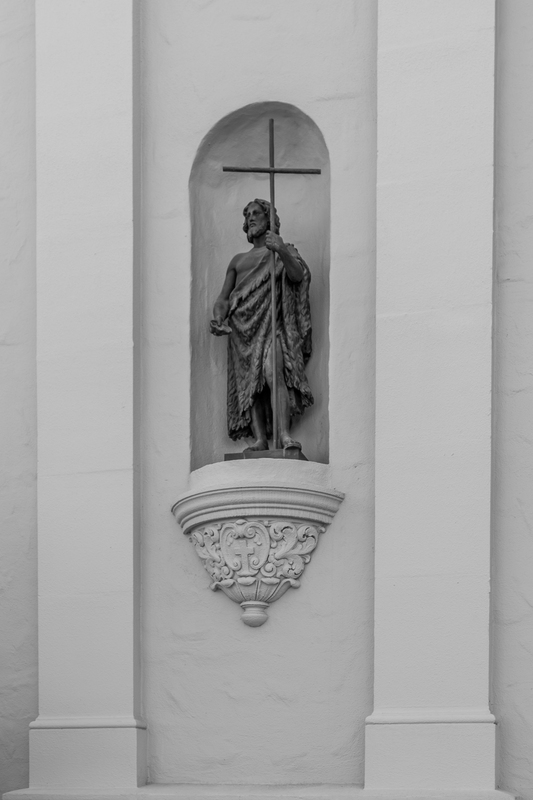 Statue of San Juan Bautista between the Bell Tower and the Mission’s main entrance. The Mission’s north wall and garden-cemetery. Another view of the garden-cemetery next to the Mission. Another view of the Mission’s altar. 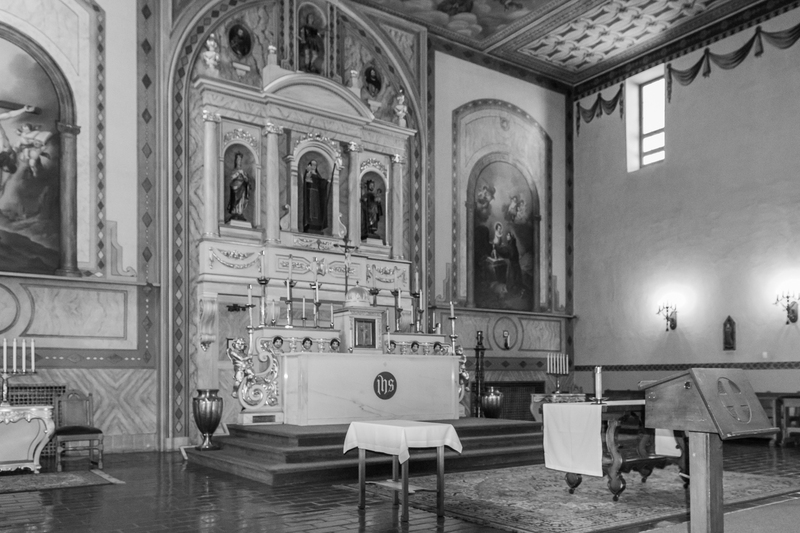 View of the back of the Mission from the altar. 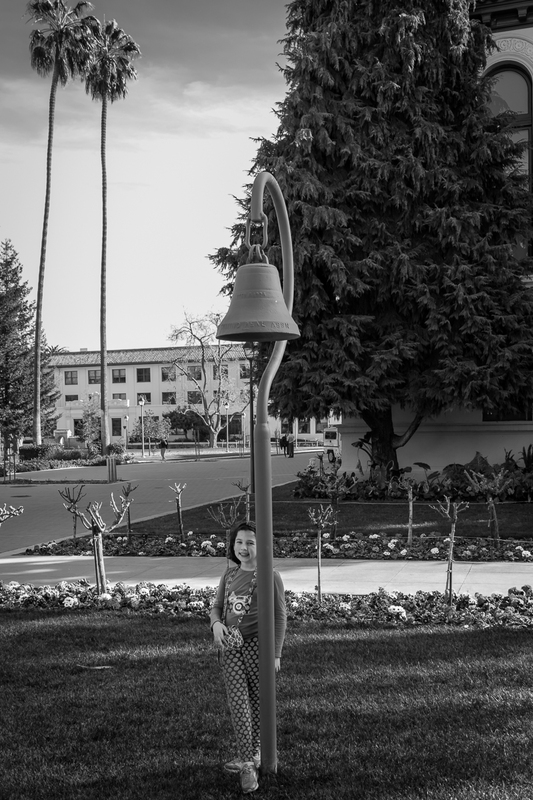 Our granddaughter Lia stands by the El Camino bell marker outside the Mission. 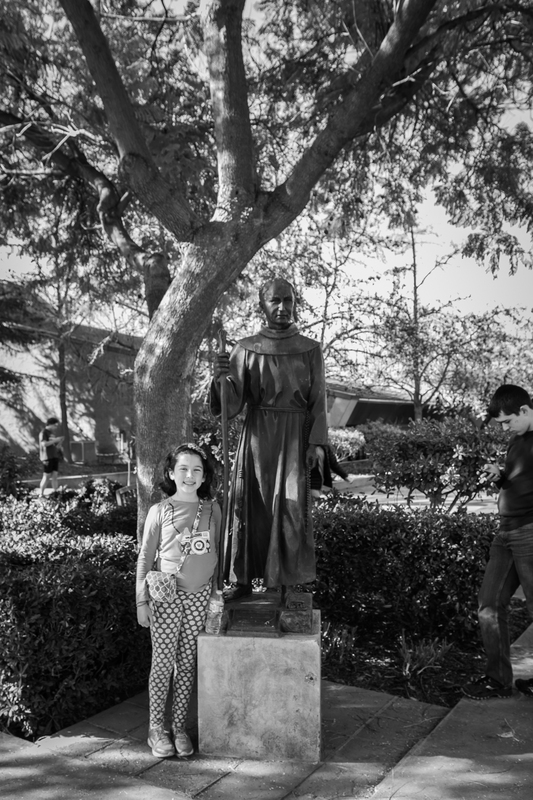 Lia at the statue of Junipero Serra behind the Mission he founded in 1777. That’s her brother Tyler on the right. Tyler had downloaded a virtual tour of the Santa Clara campus (free at the Apple iStore) to his iPhone and is preparing for the next stop on the tour. 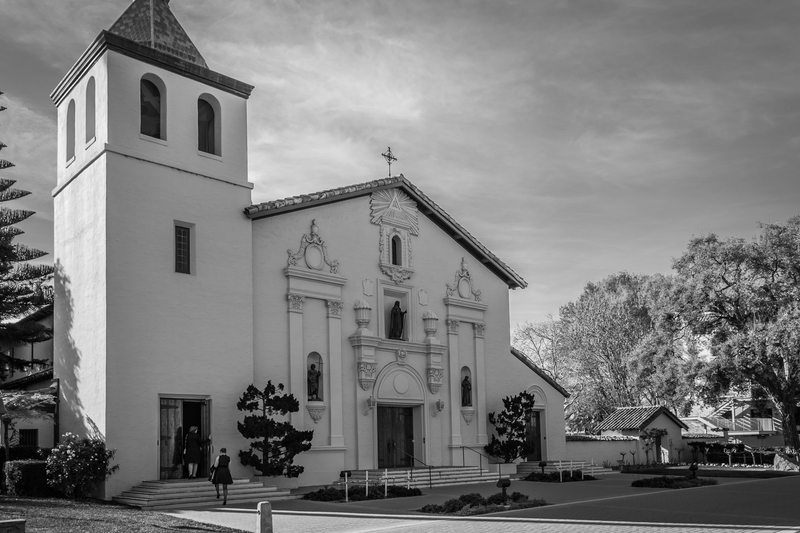 View of the Santa Clara campus from the front of the Mission. 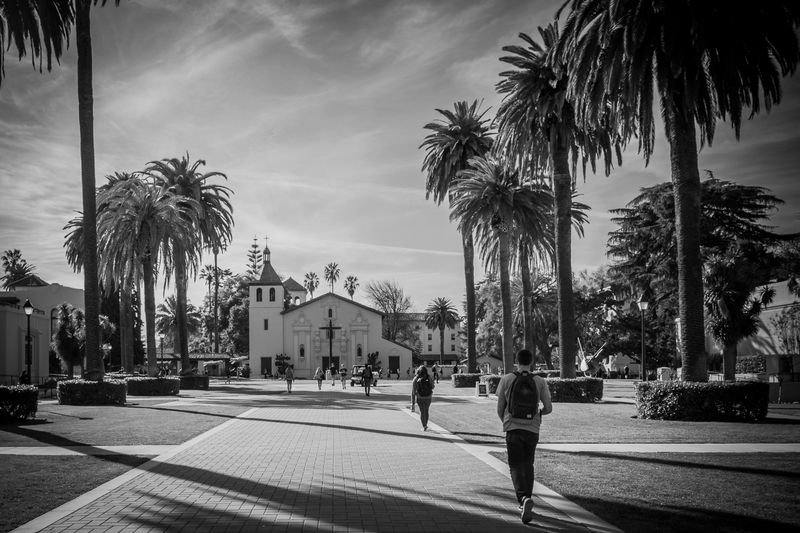 Newsweek in 2012 ranked SCU as the second most beautiful campus in the country. There are works of art spread all over the campus. This sculpture is dedicated to The Family. Australian photographer Leanne Cole hosts the weekly Monochrome Madness Challenge. Visit her website on Wednesdays (Tuesdays in North America and Europe) to see what Leanne and other photographers from all over the world are doing in monochrome these days. 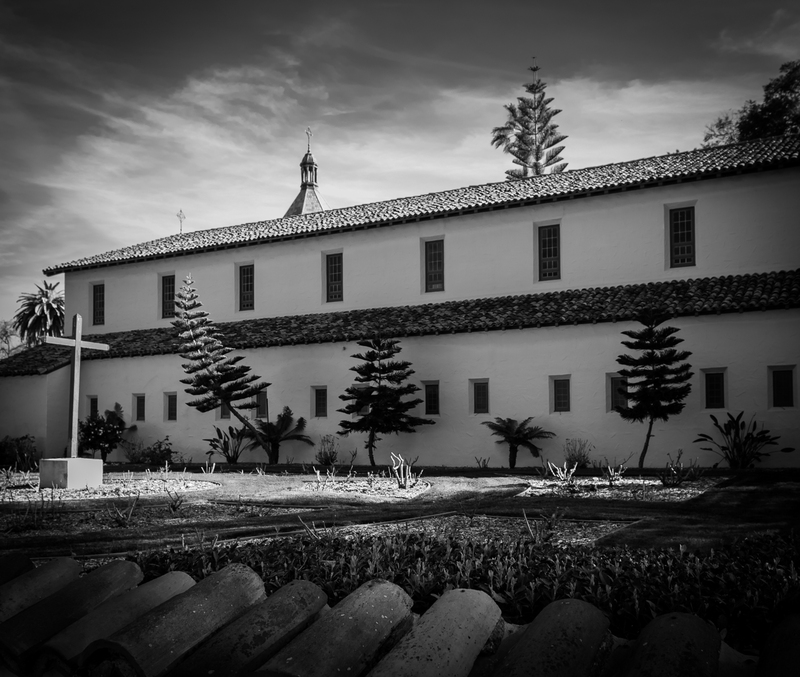 This entry was posted in Architecture, California, History, Travel and tagged California Missions, church photography, Junipero Serra, Leanne Cole, Mission Santa Clara, Monochrome Madness Challenge, photography, Santa Clara, Santa Clara University, travel, travel photography. Bookmark the permalink. The interior shots are impressive and are in great contrast to the simplicity of the outside of the building. Beautiful renditions. After the church burned down in 1925 it was decided to rebuild in the neo-colonial style and to look like the church as it appeared in 1825. The present church is built of concrete reinforced with steel, however, while the 1825 church was constructed with adobe bricks. 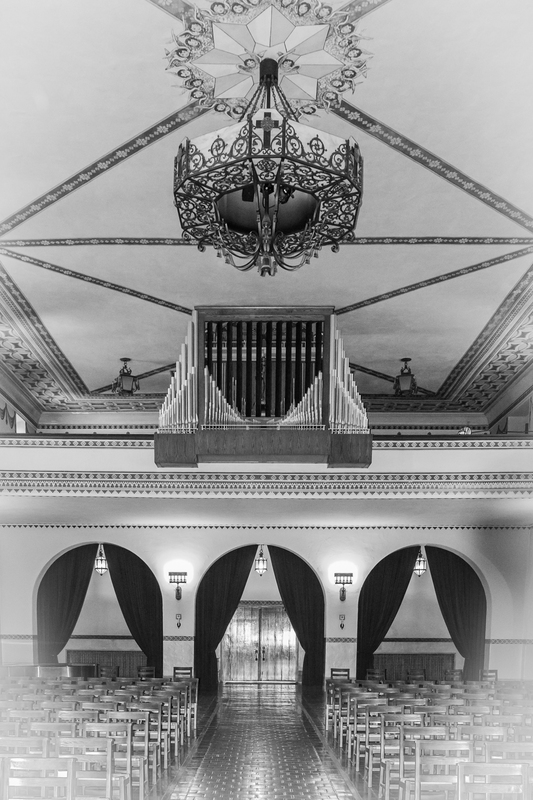 The church interior was also designed to resemble the original church, based on surviving paintings. The original walls and ceilings were mostly reds and yellows from cactus juice. The present walls are painted in mostly pinks and blues. I like each and every one of your monochrome photos! Great job, my friend! All but one of the photos were processed completely in Lightroom. I spiffed up the first church interior photo with Nik Color Efex Pro and then finished up in Lightroom. It looks stunning in B&W. it must be amazing in color. I’ll show some of the color versions in a future posting. I love these in Monochrome! My your Grandaughter has grown! How lovely that she got to experience this Mission with you. I remember your comment in one of my prior mission posts that you haven’t gotten to Santa Clara yet. 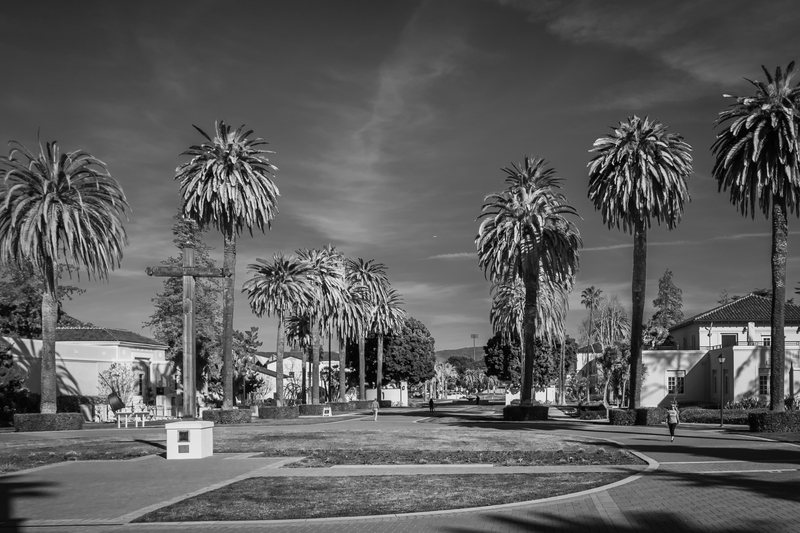 I have visited most of the missions in northern and central California (still haven’t seen San Raphael) but hope to travel to southern California someday just to visit the missions down there. We took my grandson to see La Purisma when he was in the fourth grade. His sister’s assigned mission this year is San Gabriel. So maybe we will take her along some weekend to see that mission. San Raphael is lovely you’ll like it. I hope you get to San Gabriel. Magnificent photos! Thank you for the tour of this special place. I’m glad you liked them, Amy. I think it was pretty easy to take nice pictures when the surrounding campus grounds are so beautiful!